Obama administration’s failed approach to Egypt: The United States should support democracy, not the political players. The United States should stand up for democracy, not the players on the ground. Demonstrations like this one in Cairo, in support of ousted Egyptian President Mohammed Morsi on Aug. 16, 2013, will be an endless cycle until there is true democracy in Egypt. The United States and the West should support the Muslim Brotherhood. Mohammed Morsi may not have been the most effective leader of Egypt, but now he is effectively under arrest. Never mind that Morsi’s instincts were anti-liberal or that his clear intention was to place the Muslim Brotherhood in control of Egypt’s judicial and political institutions. We ought to have supported him when he was in power, and now that he is out of power, his cause is even more important. His followers are being murdered and tortured. We should organize ourselves on their behalf and in their defense. Both arguments have merit. But both also have a central flaw, especially when made through tweets, sound bites, press releases, and other nuance-free forms of communication. They divide the Egyptian scene into two warring camps—Morsi vs. the generals, secular vs. Islamic, military vs. Brotherhood—thus tempting everyone to take sides. But neither Hagel nor anyone else in the administration has taken the next logical step. True, it’s up to the Egyptian people. Also true, we shouldn’t back one group over another, in Egypt or else. Those sorts of political games have won the United States an appalling reputation in the Middle East and elsewhere because they invariably backfire. We support the “pro-Americans,” ignore their unpopularity, and are shocked when they fall. Or we support the “modernizers,” who then turn out to be dictators, and we are shocked when they fall. The particularly virulent strain of anti-Americanism in Egypt comes, in part, from our mostly uncritical support for Egyptian dictators in the past. But there is another way to think about all this. The United States can and should stand for the rule of law, stable institutions, and democracy. And by “democracy,” I mean not just an election organized by the international community but the principle that power should change hands peacefully, inclusively, and according to a set of rules accepted by all social groups. 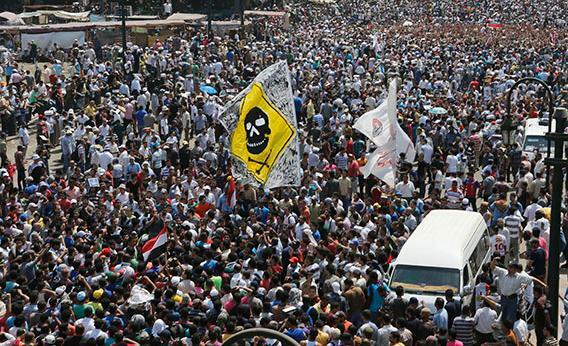 In societies such as Egypt—or Syria—the advocacy of democracy isn’t ideology but common sense. The alternative, after all, is that power changes hands violently, that some ethnic or religious groups are left out of the political process, and that social discontent remains very high. Had the Obama administration thought about Egypt in these terms, it might have had a rational, intelligible policy over the past several years. When Hosni Mubarak was in power, we should have pressured him, loudly and clearly, to hold elections. When Morsi was president, we should have called on him, equally loudly and clearly, to share power with other groups, to make concessions to minorities, to make sure that a flawed constitution was interpreted as fairly as possible. Now that the military is in power, we should come out loudly and clearly against its coup and use whatever limited influence we have to persuade the generals to return Egypt to constitutional rule. It sounds simple, but of course it isn’t. If Kerry can confuse a millions-strong demonstration with “democracy” and if President Obama can’t bring himself to use the word “coup,” then it will be difficult for this administration to be clear, firm, and consistent about the events unfolding not only in Egypt but also in Syria, Libya, and elsewhere around the world.